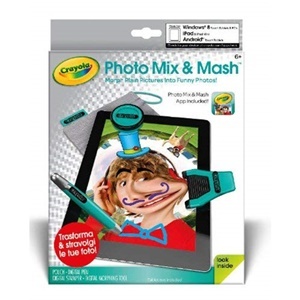 Crayola Photo Mix & Mash digitally morphs and manipulates pictures on your Windows 8 Touch Tablet, Android Touch Tablet, iPad or iPad Mini. It's easy to turn ordinary photos into fun, fabulous and funky photos! Crayola DigiTools are the perfect creative accessories for the iPad. The sleek stylish instruments produce colorful designs in a variety of wild and whimsical ways. Each DigiTool includes a free app with pages of virtual line art, animated stamp designs and other dazzling digital effects. Easily enhance, manipulate and transform photos to create incredible designs! Draw anything you can imagine and add animated images & phrases. Create awesome morphing effects, like stretching & melting. Design backgrounds or choose from scenes, like a cool skateboarding park. Unique, easy and mess-free painting fun on the iPad!